What if Hell really existed, deep within the bowels of the Earth, people by a mutated race, The Hadal. Banished by the victors in a war that happened so long ago it has been lost in the mists of time and memory. But now the Hadal are on the move, climbing up out of their subterranean caverns and tunnels and back into our world. This is Journey to the Centre of the Earth meets At the Earth's Core and Back to the Stone Age... where rich corporations invade Hadal held territory to gain access to the untold riches lying deep beneath our feet. This is the armies of Man versus the armies of night... and down in the deep, dark caverns of Hadal-Land it is always night. A place where Special Forces Recon Teams delve deeper and deeper into an enemy realm, living by the trigger, a hair's breath from capture, torture and death. Ike, ex-mountaineer, former Hadal captive and slave, now a Recon Scout who lives only to kill his tormentors. A mutated SF Major searching for retribution and atonement for the death of his company in a Hadal ambush. A Nun in search of the truth about Lucifer's fall from grace. A corporate spy and assassin with a hidden agenda. A group of highly trained military operatives and a handful of scientists are tasked with penetrating deeper into Hadal territory than anyone has ever gone before. Ike is with them, hunted by the Hadal and the very people he thinks he's working for. This is action and adventure at it's best. A host of interesting characters. A well thought out underground world, dark and eerie, yet strangely beautiful. The Hadal are terrifying; skulkers in the darkness, dimly glimpsed shadows on the edge of the light. Waitng patiently for the humans invaders to make a mistake, become seperated from the group, or step too far from the light. Firearms run out of bullets. Flashlights run out of batteries... and for the soldiers and scientists travelling ever deeper into the nightmare realm their skill and luck can only last so long. 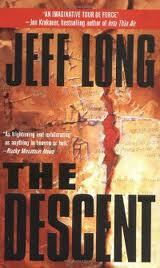 The Descent is a great novel and Jeff Long is to be congratulated. I re-read this book every couple of years and it never fails to give me a thrill. Note: The B-grade pulp horror movie of the same name bears no relation to Jeff Long's novel. It is such an obvious attempt to rip-off this author it's not funny. Complete and utter rubbish, it is simply a group of women being hunted in underground caverns by a sub-human species. That is where any similarity to Jeff's novel begins and ends.